First part is definitely OK as input has been caught. From the error it seems is the replacement part that wrong as it says resulting URL is invalid. Could it be that when using "$2" variable for both cases is wrong and instead of using @https://192.168.101.101:8447/font/$[email protected] for both one should have $1 while other $2? (Mar. 31, 2019 06:34 PM)vlad_s Wrote: What could be the problem? 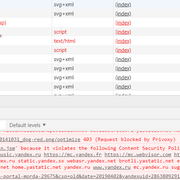 Have you added 192.168.2.1 to yandex's Content-Security-Policy header as an allowed script-src? SERVER-HEADER-FILTER: Content-Security-Policy Content Security Policy. And I tried to delete all these extra headers, I did not achieve the result. Maybe something is not right? In general, the header is modified, but still does not work. Refused to load the script 'https://192.168.2.1/decentraleyes/jquery/2.2.3/jquery.min.jsm' because it violates the following Content Security Policy directive: "script-src 'self' 'unsafe-inline' 'unsafe-eval' 'nonce-6JP75lFRjo5x8uG1ExrL7g' yastatic.net *.yandex.net yandex.st *.yandex.st yandex.ru *.yandex.ru mc.yandex.ru mc.yandex.by mc.yandex.kz mc.yandex.ua mc.yandex.co.il mc.yandex.com mc.yandex.com.am mc.yandex.com.ge mc.yandex.com.tr mc.yandex.az mc.yandex.ee mc.yandex.fr mc.yandex.kg mc.yandex.lt mc.yandex.lv mc.yandex.md mc.yandex.ru mc.yandex.tj mc.yandex.tm mc.yandex.uz mc.webvisor.com mc.webvisor.org yastat.net pass.yandex.ru suggest.yandex.ru news.yandex.ru social.yandex.ru export.yandex.ru an.yandex.ru awaps.yandex.ru yabs.yandex.ru news-clck.yandex.ru". (Apr. 01, 2019 04:11 PM)vlad_s Wrote: And I tried to delete all these extra headers, I did not achieve the result. Maybe something is not right? deleting the header may not help. Are you sure? This message from Iron does not show 192.168.2.1 in script-src section of the Content Security Policy directive. It can be seen that my added ip 192.168.2.1 appears somewhere, but the script does not load. 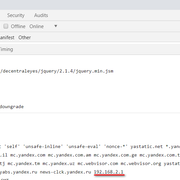 And I can see in the Apache log that the request for https://192.168.2.1/decentraleyes/jquery...ry.min.jsm does not even pass, but a message in the console like "Refused to load the script" https: // 192.168.2.1/decentraleyes/jquery/2.1.4/jquery.min.jsm ..." appears. How does the browser know that something is wrong with 192.168.1, because it did not download the script from this link to find out the Content Security Policy header? SERVER-HEADER-FILTER: Add-Content-Security-Policy Add header Content Security Policy. It seems all right? But does not work. Ahh... I don't think you understand. You need to modify the Content Security Policy response header from yandex. (Apr. 02, 2019 05:59 PM)vlad_s Wrote: It can be seen that my added ip 192.168.2.1 appears somewhere, but the script does not load. 192.168.2.1 needs to be in the "script-src" section of the response header from the yandex server. (Apr. 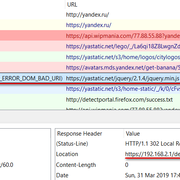 02, 2019 05:59 PM)vlad_s Wrote: How does the browser know that something is wrong with 192.168.1, because it did not download the script from this link to find out the Content Security Policy header? 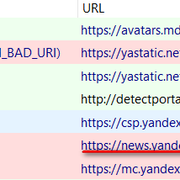 The Content Security Policy header belongs to the response from yandex.ru. It tells the browser the addresses that it may access to create the page. The script is not allowed because the address 192.168.2.1. is not allowed. The sidki set uses files from https://local.ptron:8443 . So, it adds "https://local.ptron:8443" for 'default-src', 'img-src', 'script-src', and 'style-src'. But the error did not change. Maybe I'm doing something wrong again? (Apr. 03, 2019 05:10 PM)vlad_s Wrote: I am not well versed in this. "This" is always changing. So, we are all always learning. Privoxy returns a redirect (302) to https://192.168.2.1/decentraleyes/jquery/2.1.4/jquery.min.js. Can Access-Control-Allow-Origin header be added to Privoxy's redirect (302) response? The sidki set adds 'unsafe-inline' for the inline scripts that it adds to the page. The next set will not add 'unsafe-inline'. If you don't need 'unsafe-inline', don't add it. 192.168.2.1 - - [03/Apr/2019:21:41:21 +0300] "GET /decentraleyes/jquery/1.11.3/jquery.min.jsm HTTP/1.1" 200 97729 "http://ipv6-test.com/" "Mozilla/5.0 (Windows NT 10.0; Win64; x64; rv:65.0) Gecko/20100101 Firefox/65.0"
The missing header in Privoxy's 302 response is the problem. CORS Everywhere for Firefox should allow the file to load. Try adding https://192.168.2.1 or https://192.168.2.1:443 to the extension's Activation whitelist. Is it possible to somehow weaken the site policy by removing some of the headers? (Apr. 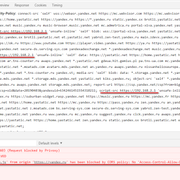 05, 2019 07:23 PM)vlad_s Wrote: Is it possible to somehow weaken the site policy by removing some of the headers? I don't think that will work. We can remove the request headers but the browser still knows that it sent them. It works. I have a bad understanding of this, but I looked at news.yandex.ru, there is code "301 Moved Permanently" for the request https://news.yandex.ru/favicon.ico for https://yastatic.net/iconostasis/_/egVpf...c22BBg.ico without transmitting the header "Access-Control-Allow-Origin: *". I am assuming that you can still configure the redirect, without filtering the page suggested with your last message? Or am I wrong?